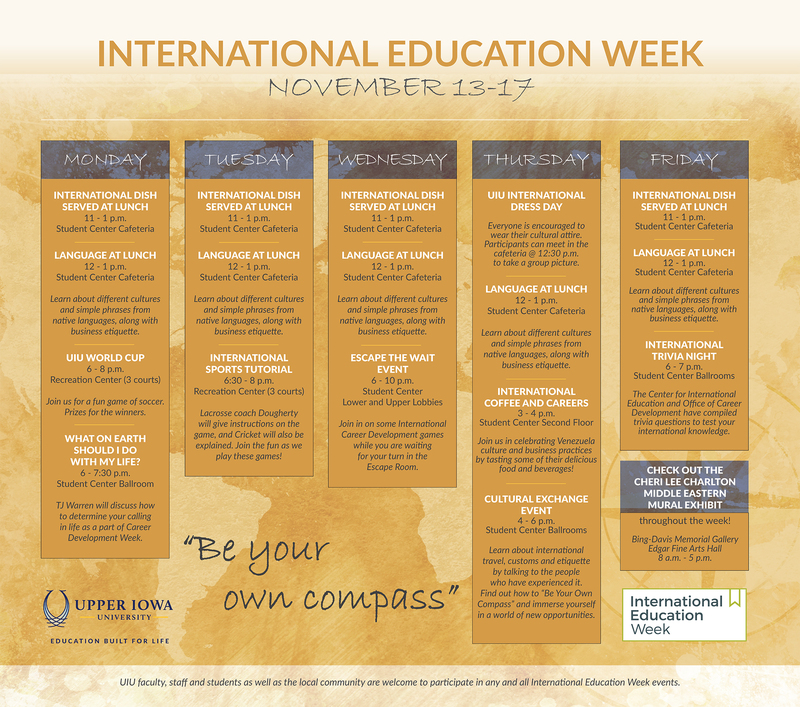 Upper Iowa University will host “Be Your Own Compass” festivities at Fayette Campus as part of International Education Week Monday, November 13 – Friday, November 17. 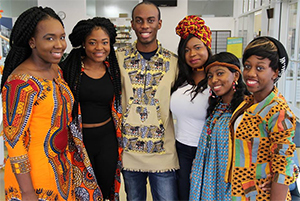 Among the students participating in last year’s International Dress Day were (l-r) Janefa James, Des Moines, Iowa; Margaret Solomon, Ghana; Aliou Issa Ba, Cameroon; Pinima Godpower, Nigeria; Frida Jabea Ngalle, Cameroon; and Baridosia Kumbe, Nigeria. Click on calendar for full listing of International Education Week activities. Upper Iowa University’s Center for International Education (CIE) is encouraging the entire Peacock community to “Be Your Own Compass” as part of International Education Week Monday, November 13 through Friday, November 17. International Education Week is an opportunity to celebrate the benefits of international education and exchange programs worldwide. A joint initiative of the U.S. Department of State and the U.S. Department of Education, the annual event promotes programs that attract future leaders from the United States and abroad to study, learn and exchange experiences. Daily – A different international student will teach simple phrases from their native language and briefly discuss their culture from noon – 1 p.m. each day in the Student Center cafeteria. An international dish will be among the menu items in the Student Center Servery from 11 a.m. – 1 p.m. The Cheri Lee Charlton Middle Eastern Mural Exhibit will be open at Bing-Davis Memorial Gallery from 8 a.m. – 5 p.m.
Monday, November 13 – UIU World Cup Soccer Tournament begins at 6 p.m. in the Rec Center. The 5-on-5 teams can sign up at the Rec Center or at IMLeagues.com. Prizes will be awarded to the winning team. On this same date, TJ Warren will present a self-discovery workshop “How to Answer the Question: What Should I Do with My Life” from 6-7:30 p.m. in the Student Center Ballroom. Tuesday, November 14 – Lacrosse, cricket and other sports will be discussed and exhibited during an international sports tutorial from 6:30 – 8 p.m. at the Rec Center. Participants will be entered to win a $25 Amazon gift card. Wednesday, November 15 – Guests will participate in international and career development games, while awaiting the opportunity to enter one of three escape rooms. The activities will be located in the lower and upper levels of the Student Center from 6 – 10 p.m. The escape rooms are being hosted by UIU’s Student Life. Thursday, November 16 (International Dress Day) – Venezuelan culture and business practices will be featured during the international coffee and careers activity from 3 – 4 p.m. on the Student Center second floor. UIU students, faculty, staff, and outside universities and organizations will host a cultural exchange event that includes information on study abroad programs, international travel, activities, customs and etiquette. Friday, November 17 – CIE and Office of Career Development staff members will host the International Trivia Night from 6 -7 p.m. in the Student Center ballrooms. Sign up your team at uiu.edu/ITN. A prize will be awarded to the winning team. The UIU Center for International Education is responsible for all internationalization initiatives at Fayette Campus. The CIE coordinates international admissions, international student and scholar services, education abroad, intensive English programming, and the UIU-Malaysia and UIU-Hong Kong centers.